Typhoid is spread by infected human waste, so safe food, clean water, improved sanitation, and good hygiene practices are key to preventing the disease. But they cannot do the job alone. Because of the significant burden of typhoid and the growing threat of drug resistance, the role of vaccines alongside safe water, sanitation, and hygiene interventions is critical in high-risk, typhoid-endemic areas. This is especially important among rural and hard-to-reach communities where progress in medical services, infrastructure, and development may be slow. Additionally, typhoid vaccines are valuable for travelers, food workers (including street vendors), household contacts of typhoid carriers, and laboratory workers. Three typhoid vaccines are currently recommended by the World Health Organization (WHO). Uptake of the Ty21a and ViCPS vaccines in typhoid-endemic countries has been low. The Ty21a vaccine requires numerous doses, and the Vi capsular polysaccharide (ViCPS) vaccine has short-lived protection. Additionally, neither vaccine is amenable to use in children younger than two years of age, which limits the potential health benefits and prevents use in routine childhood vaccination programs. Gavi, the Vaccine Alliance does not provide funding for Ty21a or ViCPS vaccines. New typhoid Vi conjugate vaccines (TCVs) have great potential to address the limitations of the existing vaccines. TCVs strengthen the immunogenic properties of the ViCPS vaccine and have been found to elicit strong, long-lived immune responses in both infants and children. These vaccines are of particular interest to the global health community because, unlike the existing vaccines, they could be delivered to children younger than two years as part of routine childhood immunization programs. 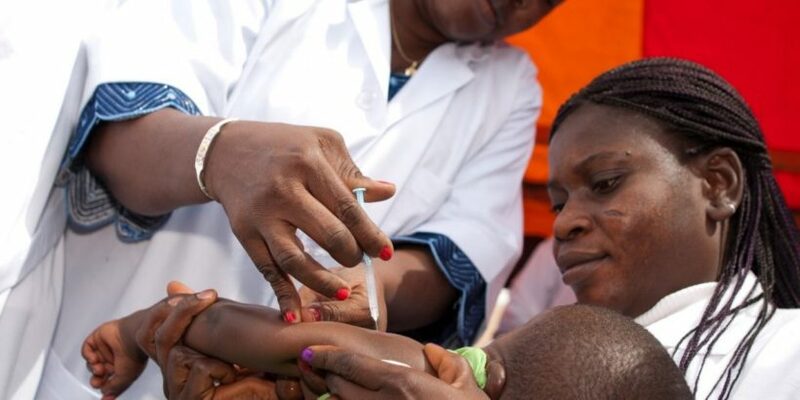 In November 2017, Gavi announced a US$85 million funding window to support the introduction of typhoid conjugate vaccines in developing countries in 2019 and 2020. The leading TCV vaccine, Typbar-TCV®, is manufactured by Bharat Biotech. It is administered in a single dose. Approved for children six months of age and older, Typbar-TCV is currently licensed in India, Nepal, Cambodia, and Nigeria. As of early 2018, the vaccine is undergoing two phase IV post-licensure trials. Typbar-TCV was prequalified by WHO in late 2017 and recommended by WHO in 2018. Another advanced TCV candidate is called PedaTyph™, which is manufactured by Bio-Med and is licensed in India for children three months of age and older. Efficacy trials of PedaTyph have found more than 90 percent efficacy against typhoid. However, it has not been submitted for WHO prequalification. Nine other TCV candidates are in various stages of development. WHO recommends programmatic use of typhoid vaccines for the control of typhoid fever. […] Among the available typhoid vaccines, TCV is preferred at all ages in view of its improved immunological properties, suitability for use in younger children and expected longer duration of protection. Countries may also consider the routine use of ViPS vaccine in individuals aged 2 years and older, and Ty21a vaccine for individuals aged more than 6 years. In choosing a typhoid vaccine, the costs, programmatic issues and duration of protection should be considered. of the routine childhood immunization programme. Gavi applications for TCV introduction support are now open for eligible countries.